turkey family, originally uploaded by jahansell. Indian Mountain Road is the place to see wildlife - I saw a bobcat crossing there last week. 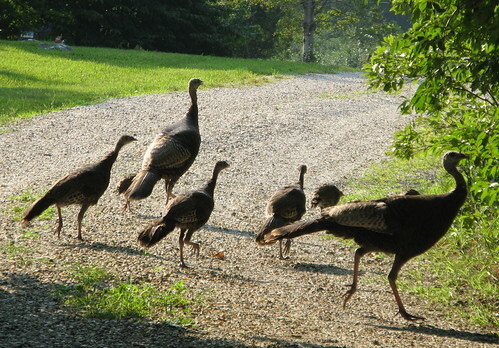 Yesterday this turkey family strutted out in front of my car. They seemed to have two sets of babies, little ones and teenagers - I didn't know they'd raise two sets in one year. They all got across except for one laggardly teen who was stuck in the bushes - I waited patiently and he finally scrambled to join the rest of his family, who was heading up this gravel road. that´s so cute, the hoel family together, beautiful capture!